As we can see, there are very little differences in the hardware department. Both systems are running on par with each other, practically neck and neck. The major differences is in which the way Sony is treating their consumers; that is, by not treating them any differently. Microsoft, on the other hand, is giving 3rd party publishers complete control over the game license approach and restricting the second hand sale of games to anyone but retailers, let alone how and when you can share them or even give them away, all through the power of the internet and registration processes. As we’ve seen in the past couple of months, the masses are not happy, and many Xbox loyalists, while standing with Microsoft, cannot also defend their poor choice of anti-consumer practices with the Xbox One. Other differences are damning. First, the bad news: Playstation 4 will no longer have free-to-play online play. It will now require a subscription like Xbox Live’s where you pay so much a month. It is currently unconfirmed, but whether the Playstation Plus subscription will not change in price and remain $49.99 a year is yet to be seen. However, the service will expand with all the social networking, sharing, Gaikai, and U-Stream services. However, Sony stated that all of the entertainment services – such as Netflix and Hulu Plus – will remain free to use on your PS3, as these services connect to their own servers and already incorporate their own subscription plans. The good news is that Xbox Live won’t be changing. Still the same Xbox Live experience you know and love, a better interface, easier navigation, even much more services for TV and networks to give you special premium access to shows and movies, multi-tasking, Skype, demos, and more. A new addition to Xbox Live is how they will copy Playstation Plus directly by providing subscribers with free retail copy games to download starting today with Fable III, followed by Halo 3 and Assassin’s Creed II by the end of the month, and then two more added to the list per month. It’s nowhere near 10 at a time, but it’s a good start. Microsoft Points will go extinct as they will go by actual currency now, though fact that this is good news is sad to begin with. If you’ll notice, however, Sony is not requiring a subscription to Playstation Plus for all of the entertainment services, while Microsoft still requires you to foot the bill on Xbox Live and on your services like Netflix and Hulu Plus, giving gamers more of a reason to try things out on the Playstation 4 before fully embracing an online world. The answer can be quite easy. Say what you will, but a good piece of entertainment can go a long way. A lot of people are still gun-ho for their Xbox Ones because it’s the only place to find Halo, Forza, and others. It’s already a recognized online infrastructure that works solidly, rare when it falters, rare when online game don’t work on day one, better moderated for cheaters and people who disrupt games, and no major hacks that takes down the service for a month plus. That’s fine. To turn a blind eye to consumer rights is where the line gets drawn with a lot of people, and a lot of people aren’t willing to pay to see if they can coexist with the new rules Microsoft imposes on them. These people will either steer clear of gaming altogether, or migrate over to the Playstation 4. Seeing as gamers can be extremely fickle, I see the latter happening en mass. Marketing wise Sony is the clear winner but there are some key points you missed. Microsoft is allowing up to 10 family to play anything on your system. Also (this can also be argued) Microsoft is changing kinetic to be more revolutionary where Sony is basically ps3 with updated graphics. Not to mention all the exclusives Xbox is going to have. PS4 is not basically just PS3 updated, man. 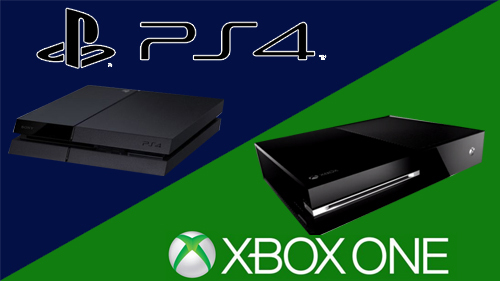 Both the XBone and the PS4 are literally on par with each others hardware. If you want to get specific, PS4 is still just a tiny bit more powerful with GDDR5 instead of DDR3, meaning XBone will bottleneck quicker. Also, the PS4 will be offering some crazy awesome online features with the Gaikai service in the future with past games, and at launch being able to start playing your games AS you download them, which is phenomenal. Then there’s all the Ustream stuff which I’m excited to hang out with my friends like I used to, except millions of miles away. The Kinect 2.0 IS amazing, don’t get me wrong. But what you’re willing to give up for its use and the ticket price is NOT worth all of the headaches and the fact that you don’t own what you buy. As much as I want Titan Fall, as much as I want more Halo, those exclusives will wait before they see my living room. And I’m talking years. Or until I win the lotto. The family sharing stuff IS awesome. However, I don’t see that lasting. Remember that Sony did the exact same thing with the PS3 allowing 5 PSN IDs to share one piece of DLC, and they QUICKLY turned that around after they saw less sales.